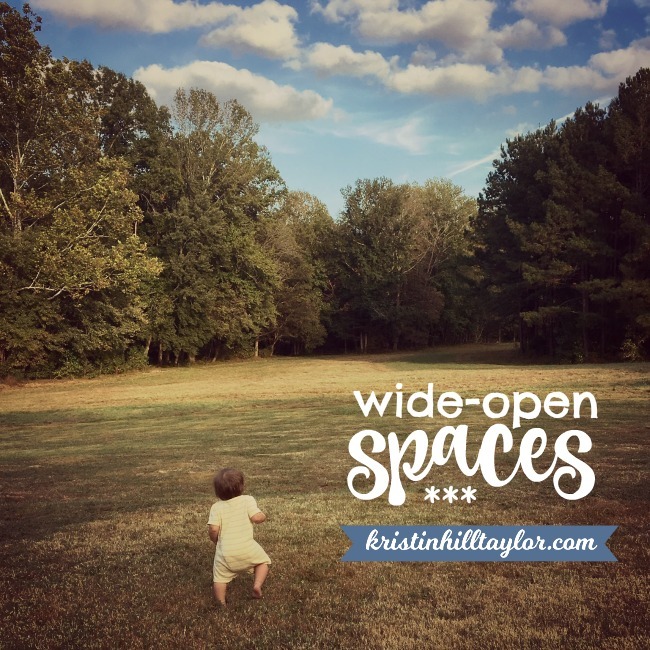 Today’s post is vintage ThreeWordWednesday in that these three words – WIDE-OPEN SPACES – were twirling around my mind for days, so I just wrote on them. It’s like God gave me a writing prompt and I took it. More importantly, this is what he’s teaching me in my life, so here’s a snippet of what and how I’m learning. I’m grateful for this community that gathers here each Wednesday. I feel my mind is running wild with ideas. I’ve got inspiration for my ebook update. I have multiple parties in the planning stages. Greg and I talk about what we want for our land and home. Parenting has been hard in some regards, but I see the light in the cracks. I’m (still) learning my ideas thrive best in wide-open spaces, when there is white space on my calendar and in my soul. Honestly, this wide-open space is easier to find in the country. The literally space around me quiets my soul. When I’m home, I’m home and not thinking about running to the grocery for one thing. I group my errands so they’re in stretches and not scattered throughout the day. Wide-open space in my day quiets and calms and inspires. Of course, there are days that are crowded and rushed, but I’m striving to not make that the norm. I’m saying “no” and “not right now” so I can say “yes” to what matter most. This reminds me of the unforced rhythms of graces Jesus wants us to learn. On Monday, the “yes” was to soccer in one of the actual wide-open spaces at our house. We had so much fun, laughing and playing. I walked back into the kitchen sweating but with a full heart — and, you know, that was some real rest for my soul. That playtime with my favorites was what we all needed. We didn’t need another afternoon of rushing through homework to get to chores before dinner. I made dinner earlier and then freed up a time to play. Playing wasn’t on my to-do list but it’s what I needed to do – and thanks to some wide-open spaces it happened. Thanks to Capitol CMG, I’ve got another just because giveaway! And this one comes with a little confession: We love pop music around here. And when I say “we,” I mean all five of us. So who needs some truth-telling pop music in their life? 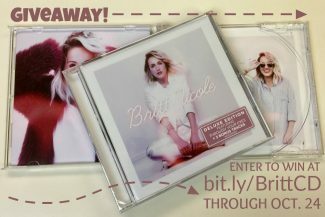 Enter to win a copy of Britt Nicole’s newest CD through Oct. 24. Kristin, I LOVE that photo! I loved it the day you posted it on FB. It is one of those photos which just says it all and without a single word 🙂 Rachel is teaching us all so many lessons and breathing a fresh word into some old lessons too! Blessings! Oh, I know. I hold onto those days during the busy times and am grateful they always come again. Glad you’re here, Lisa! You’ve been on my mind, friend! I loved seeing your pictures of your visit out west recently. Um, yes, please, move to Kentucky or Tennessee. That would make me so happy, selfishly. 🙂 Love you dearly. You are living “wide-open”, writing “wide-open”, parenting “wide-open” – it shows everywhere and I like it a lot! This comment made my day. Seriously, thank you. Wide open spaces are a gift. We all need to find time for those places in our lives. Kristin, freeing up the white space has ben such a challenge for me since this school year began. Your words hold such truth, one God hs had to remind me of many times–sometimes I need to say no to the good soI can say yes to the best. It’s a challenge for me too, Jeanne. But I’m always glad when I do free up some space. Hoping you find some white space on your calendar and in your soul this week! Thanks for being here!